Hydrea`s Professional Dry Skin Brush features extra firm curved cut cactus bristles making it the professional`s choice for dry skin brushing. The bristles are curved cut to ensure a scratch-free dry skin brushing experience. Its ergonomic design makes it easy to use, whilst the strap holds the brush firmly in place in your hand. The Brush uses FSC certified Beechwood. Dry brushing is best carried out before a bath or shower. Start at the soles of your feet brush in long strokes up your legs, the concentrate on brushing your hands and up your arms. When brushing your chest and upper back focus the strokes towards your heart. Brush in circular motions over the abdomen. Below are reviews of Dry Skin Brush made with Cactus Bristle and FSC Beechwood by bodykind customers. If you have tried this product we'd love to hear what you think so please leave a review. 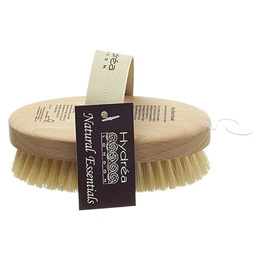 Hydrea`s Professional Dry Skin Brush with Cactus Bristle and FSC Beechwood features extra firm curved cut cactus bristles making it the professional`s choice for dry skin brushing.